The majority of visitors come from Spain & United Kingdom. Topics: Gift Vouchers, Road, Barefoot & Minimal, Racing & Lightweights, and Neutral. 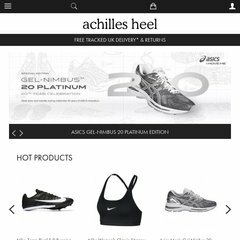 achillesheel.co.uk Shoe Size Conversion Charts for sports shoes at Achilles Heel ..
achillesheel.co.uk FitFlops | FitFlop | FitFlop Shoes | FitFlop Sandals | FitFlop ..
1,381 users visit the site each day, each viewing 33.00 pages. It is written for PHP/5.3.8 language. It is hosted by Simply Transit Ltd (England, Berkshire,) using Apache/2 web server. It has 2 DNS records, ns10901.ukvpshosting.com, and ns10902.ukvpshosting.com. PING (217.112.84.105) 56(84) bytes of data. The server is faster than 72% of measured websites, at 2152 milliseconds. Also a time of 122 ms, is recorded in a ping test.